Xilitheme select provides an automatic selection of themes : one for current browsers and another for iphone/ipod touch browser. The plugin xilitheme-select don’t content itself themes. The themes remain in Themes folder and are selected by the current browser and the rulers defined by webmaster. Webmaster is totally free to define (the look of) the theme on each side (deskop or iPhone). There is no automatic look transformation. – this first release is easy to use by admin/webmasters with knowledge of WP themes. In addition of your current selected theme add in the themes folder a theme folder named as the current with extension ‘_4touch’ dedicaced for iphone browser. See the (documented) source of the plugin to discover other type of instantiation of the class `xilithemeselector`. One provide a way to have or not a admin dashboard interface to set the specs with only php coding. 4. Go to the dashboard settings tab – Xilitheme select theme. When I visit the site with iPhone or iPhone simulator, I don’t see the specific theme ! Verify that the folder of this theme has a right name with right extension. Why the option full name or extension ? It is an easiness to choose a theme with a folder without the proposed extension. Do you provide a theme for these mobile device as iPhone or iTouch ? Why an option to disable admin UI ? Written as a class, the xilitheme select plugin deliver object and vars useful for theme’s developer that are interested to provide good design for iPhone users of a website. 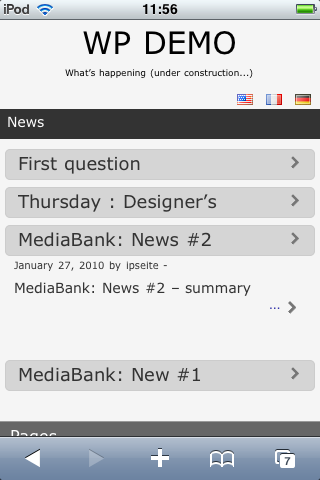 The demo Touch theme with titles as button to see excerpt. By default, xilitheme select detect for iphone the theme with folder and extension « _4touch ». In this example : in the first part, a diagnosis of the current theme and phone theme is done (1). and in (2), the webmaster has choosen the method of « full name folder ». It is useful during developing phase when evaluating different release of themes. 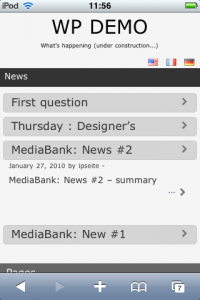 Ce contenu a été publié dans News, Plugins WP, xilitheme-select, avec comme mot(s)-clé(s) iphone, ipod touch, plugin, theme, wordpress, wp. Vous pouvez le mettre en favoris avec ce permalien. Ping : XILITHEME» Archive du blog » Question #3 : le thème sera-t-il compatible iPhone / iPod Touch ? The comments are now open ! A couple suggestions for future releases! -Offer suggestions on how to make the users website more iPhone compatible. Yes, the plugin tells the phone where to go to get a theme just for itself, but after that the user is very much on their own! It took me a while to figure out what to do, but only after looking around first. I found this web page to be a huge help, and I definitely think you should offer tips like this to help folks out! -There’s a few nice plugins out there that let users make that little icon when you save a link to your home screen… Perhaps think of integrating something like this as well, so the webmaster can have an overall easy experience all through one plugin! I hope to see some of these ideas put into good use, they would definitely help out anyone looking to use this amazing plugin! Thanks for your comments. Congratulations for your theme on your site. This is a first release. We are working since weeks on all your suggestions. About theme : thanks for the link but I suggest that you read the Apple doc in Dev parts… very clear. Do you read the php code of the lite theme available here (some special function and with the icon for touch home page) ? A full theme will be soon available. About cookies : It is planned – it will be an option integrable by the theme designer. – when switching, the user will remain on the same page but not go to the home ! Today there his around 3 or 4 plugin/theme available that do ‘theme selection’ since 2006. Why xilitheme select ? – a tool with no mandatory theme (the designer can choose it) – some tools don’t permit to have a fixed page as home. A theme in the themes folder and not elsewhere. Ping : xiliphone kit » How to prepare a WPSC shop iPhone (iPod Touch) compatible ? Question : where can we see website with xilitheme select ? Hi! I really think that the « full theme/iphone theme » option would be GREAT!